Home sales decline, but prices remain strong in Kentucky. 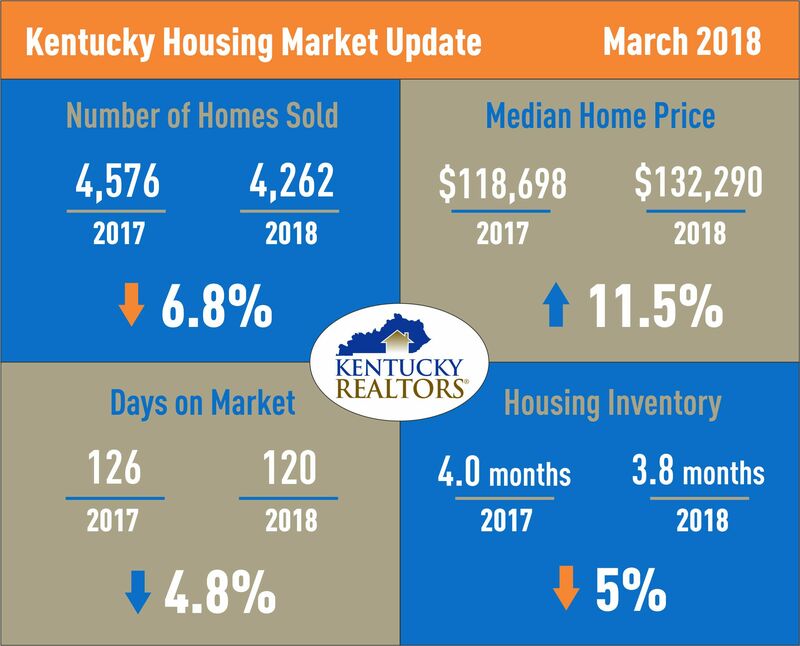 Home sales in Kentucky did not follow the national trend in March, as transactions in the state were down 6.8 percent for the month compared to March 2017 (4,576 in 2017 versus 4,262 in 2018). Nationally, sales rose 1.1 percent. Even with the drop of 314 total sales, March 2018 was still the second highest on record, just edging out March 2006 when 4,106 homes were sold. Total homes sold for the month were up 36 percent over the previous month. For the first quarter of the year, sales ended down 3.7 percent, with 10,419 homes sold in 2018 compared to 10,821 homes sold in the first three months of 2017, a difference of 402 transactions. Home prices in the state reached a median of $132,290 in March, an 11.5 percent increase over March 2017 ($118,698) and 10.7 percent over the previous month ($119,523). March’s median price is the fifth highest on record, but is still just over half of the median for the country. The months ahead are traditionally the peak for home sales and Kentucky has seen a slight decline in housing inventory to this point in the year, with 3.8 months of supply for March – a decrease of 5 percent over last year and down 2.1 percent, to 4.7 months, for the quarter. Because of the tight supply, days on market also saw a decline, falling to 120 days in March which is down 4.8 percent over last March. For the quarter, homes closed 4 days faster, hitting 122 days in 2018. Nationally, the momentum is swinging toward home ownership. In 2017, the homeownership rate rose for the first time in 13 years and the first quarter of 2018 marked the fifth consecutive quarter where the homeownership rate rose from the prior year, jumping almost 1 percent to 64.3 percent. This is being caused by a variety of factors. Not only is the economy strong, loosening credit standards, rising rents, continued low mortgage rates and a demographic shift where the large millennial generation is entering its prime home buying stage are contributing factors. Date Source: Kentucky REALTORS® which represents more than 10,800 REALTORS® who are involved in all aspects of real estate, including residential and commercial real estate brokers, sales agents, developers, builders, property managers, office managers, appraisers and auctioneers.